Best way to answer frequently asked HR Interview Questions for Freshers on Questions like Tell me about yourself, Why should we hire you, your strengths and weaknesses, how to handle challenging situation, your hobbies and interests, inspiring person in your life, change management, flexibility, Why do you want to work for us, about the company, expectations from your first job etc. Before we start, remember that, in a HR interview, there is no right or wrong answer. All you have is a right way of answering, but the answer in itself depends on the candidate. 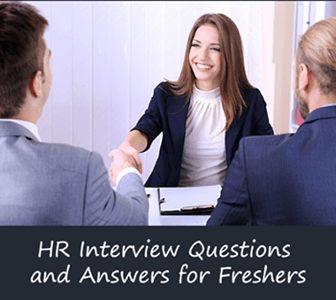 Before you dig into the questions and answers for a fresher HR interview, it will be helpful to read the introduction article here - HR Interview Preparation Tips for Freshers. Earlier article explains how one prepare for a HR interview. A common mistake seen is most HR interview is to start the sentence like “I am basically from...” No need to start a sentence like that. Locations they operate from and main business geographies. “Never really thought about it... maybe, I will start a company then”.